Sketch F No. 3 Showing the progress of the Survey of Cedar Keys, Bahia Honda, Key Biscayne Key West & Dry Tortugas In Section No. VI 1849 - 53. 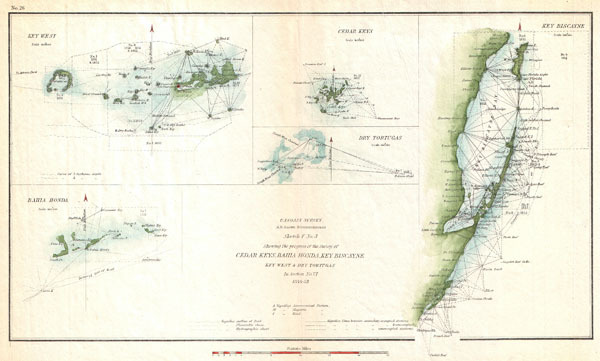 This is an 1853 triangulation chart of Biscayne Bay, Key West, Bahia Honda, the Cedar keys and the Dry Tortugas produced by the U.S. Coast Survey. Essentially five maps compiled onto a single sheet. Upper left map focuses on Key West, Florida, and the surrounding islands. Upper right map details Key Biscayne Bay, just south of Miami and north of Key Largo. Other maps show the Cedar keys, the Dry Tortugas and Bahia Honda. Prepared under the supervision of A. D. Bache for the 1853 Report of the Superintendant of the U.S. Coast Survey. Report of the Superintendant of the U.S. Coast Survey, (1853 edition). Very good condition. Minor discoloration on original fold lines.